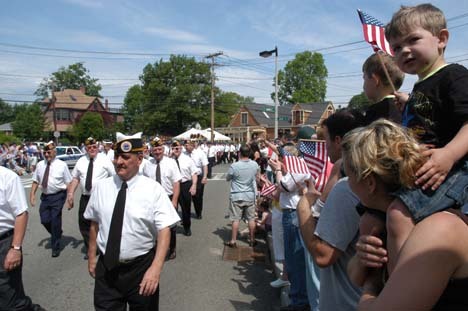 Memorial Day Parade: Members of the McKeon Post marched into Cedar Grove Cemetery during the 2006 parade. Photo by Bill ForryOne of Bostonâ€™s oldest observances of Memorial Day will take to the streets of Lower Mills and Cedar Grove on Monday morning. A parade of veterans and marching bands will step off from Richmond Street and Dorchester Avenue at 10 a.m., following a route via Gallivan Boulevard and Adams Street to Cedar Grove Cemetery. Hundreds of people typically gather along the parade route and then at the cemetery, where solemn ceremonies will honor the neighborhoodâ€™s war dead stretching back to the Civil War. This yearâ€™s parade will include bands from Northeastern University and Massachusetts Maritime Academy, along with bagpipers from the Boston Police Gaelic Column and the Greater Boston Gaelic Brigade. Also listed in the official program are St. Brendanâ€™s Color Guard, the Irish 28th Massachusetts Volunteers, St. Markâ€™s Boy Scouts and the Thomas J. Kenny School Band. The events are organized each year by a committee of neighborhood veterans from seven different posts. This yearâ€™s â€œhost postâ€ in the John P. McKeon Post #146 AMVETS, based on Hilltop Street. A guest speakerâ€” typically an active-duty military officer â€” gives an address at the cemetery, but no speaker has yet been identified by the committee. Following the observances at Cedar Grove, many Vietnam veterans â€” including scores of Vietnamese-American vets â€” will gather at the Dorchester Vietnam Memorial on Morrissey Boulevard for a ceremony, which typically begins around noon.